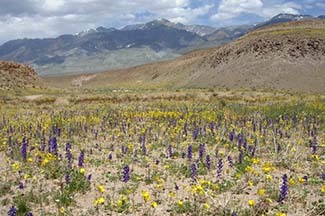 Vegetation of the Owens Valley has been studied, classified, and described in many ways. Paiutes living in the valley when the first Europeans arrived were well-acquainted with the native flora and had developed extensive irrigation systems in several areas to propagate food plants (Lawton et al 1976). On the other hand, only four years later (1859), Captain J.W. Davidson of the U.S. Army evaluated the valley quite differently: “Every step now taken shows you that nature has been lavish of her stores. The Mountains are filled with timber, the valleys with water, and the meadows of luxuriant grass. Some of the meadows contain, at a moderate estimate, ten thousand acres every foot of which can be irrigated” (Sauder 1994). Ecologists describe vegetation in terms of both physiographic features of the environment in which it occurs and particular associations of species. These occur along the Owens River and streams flowing from the Sierra Nevada. Important tree species include Populus fremontii (Fremont cottonwood), Salix gooddingii (Goodding’s black willow), Salix laevigata (red willow) and, along a few streams, Quercus kelloggii (black oak). Common shrubs include Salix exigua (Coyote willow) and Rosa woodsii (wood rose). Leymus triticoides (beardless wildrye) is a common grass, and rushes and sedges are abundant as well. Tamarix ramosissima (tamarisk, or salt cedar), a non-native shrubby tree, has invaded many riparian areas in the Owens Valley and is the object of ongoing eradication efforts. Riparian forest communities statewide are classified as “very threatened” by the California Natural Diversity Database (Sawyer and Keeler-Wolf 1995). These occur in areas of shallow groundwater on the valley floor. Two native grasses are characteristic of alkali meadows: Sporobolus airoides (sacaton) and Distichlis spicata (saltgrass). The meadows are home to several endangered species such as Calochortus excavatus (Inyo County star tulip) and Sidalcea covillei (Coville’s checkerbloom). Alkali meadows themselves are classified as “very threatened” by the California Natural Diversity Database (Sawyer and Keeler-Wolf 1995). Alkali shrub communities are typically dominated by such plants as Atriplex lentiformis ssp. torreyi (Nevada saltbush), Chrysothamnusnauseosus (rabbitbrush), Sarcobatus vermiculatus (greasewood), and Suaeda moquinii (inkweed). When subject to such anthropogenic stresses as groundwater pumping and cattle grazing alkali meadows are vulnerable to invasion by shrubs and weeds. These occur on the broad bajadas and alluvial fans which descend from canyon mouths of the Sierra Nevada and the White and Inyo Mountains. Common species include Atriplex confertifolia (shadscale), Ephedra nevadensis (Nevada ephedra), and Eriogonum fasciculatum (California buckwheat). At the northern end of the valley there are large stands of Coleogyne ramosissima (blackbrush) as well as such Great Basin species as Artemisia tridentata (sagebrush) and Purshia tridentata (bitterbrush). In the southern half of the valley Mojave Desert species such as Larrea tridentata (creosote bush), and Ambrosia dumosa (burro bush) occur. Drought tolerant plants have developed strategies to maximize their efficiency in use of water. This allows them to thrive in areas where moisture is not adequate for most species to survive at all. Alluvial fans and slopes of desert mountains are characteristic landforms for drought tolerant species. Some local examples are shadscale and creosote bush. Drought evasive plants, on the other hand, have developed strategies to maximize growth in areas where a reliable supply of water is available. They out-compete drought tolerant species where water is abundant but don’t occur at all where it is not and so evade drought entirely. They typically occur along rivers and streams and in areas where groundwater is close to the surface. Groundwater dependent vegetation (GDV) is the phrase used in the LTWA and its technical appendix (aka the Green Book) to describe vegetation composed of drought evasive species. Management of GDV is one of the primary concerns of the LTWA because GDV is vulnerable to water table drawdowns caused by groundwater pumping. In Owens Valley, GDV originally covered large areas of the valley floor, as well as narrow strips along streams coming down from the Sierra and isolated patches surrounding springs. Much of the original acreage of meadow was cleared for agriculture and for construction of the towns. Hall, C.A., Jr. (Ed.) 1991. Natural History of the White-Inyo Range Eastern California. California Natural History Guides: 55. University of California Press. Berkeley. Lawton, H.W., P.J. Wilke, M. DeDecker, and W.M. Mason. 1976. Agriculture among the Paiute of Owens Valley. The Journal of California Anthropology: 3(1) pp. 13-50. Sauder, R.A. 1994 The lost frontier: water diversion in the growth and destruction of Owens Valley agriculture. University of Arizona Press. Tucson. Sawyer, J. O. and T. Keeler_Wolf. 1995. A manual of California vegetation. California Native Plant Society, Sacramento, Calif.